The alphabetical overview tells me that we have not covered many words starting with ‘J’. So, to improve the situation, today’s word is ‘jennen’. The verb ‘jennen’ in general is less serious than ‘pesten’ which can take the meaning of ‘to bully’. Also, ‘jennen’ is used when you are teasing somebody with the objective to annoy, as opposed to ‘pesten’ which you can also use to tease somebody about say a physical characteristic. A synonym of ‘jennen’ is ‘plagen’ however I have the feeling that the ‘annoyance factor’ is bigger for ‘jennen’. – Plagen: to pester, annoy, torment, bully [verb] [plaagde, geplaagd]. – Treiteren: to torment, provoke [verb] [treiterde, getreiterd]. – Pesten: to pester, badger [verb] [pestte, gepest]. – Lastigvallen: to bother, harass [verb] [viel lastig, lastiggevallen]. 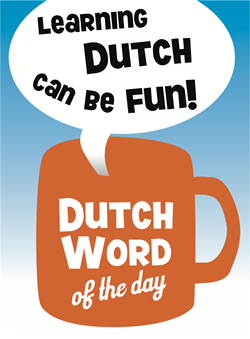 This entry was posted in Dutch word of the day, DWOTD 1.0, Vocabulary Intermediate and tagged jennen, lastigvallen, pesten, plagen, treiteren by Sander. Bookmark the permalink.